Delilah says "I ain't birthin' no babies". After a year and change for Delilah, and a year and half for Bunny, both girls have decided to take another shot at motherhood. A house full of hormonal girls is making my life very interesting at the moment, and it’s about to get even more so with the arrival this weekend of the adorable – and very adolescent hormonal – Zeus, aka Bullmarket Absolut Notorious. In the space of a month, Zeus has gone from Mr. Innocent to Mr “I’ll Hump Anything That Moves”, so this should be fun vacation (for him, at least). I’m crossing my fingers that Penelope will decide NOT to take part in the annual festive parade of hormones, as if she does I’ll have no other choice but to breed her. Her little brush with pyometra last time she was in season means that this cycle is do or die for her – it’s babies or spayed for our little Punky Princess. Personally, I’m hoping for puppies, but I’m hoping even more that she’ll go against the tide and wait until spring… or later. For more details on puppy plans, check out our litter news page. Oh, and cross your fingers, because the last time we tried this, all of the girls missed. Breeding Frenchies sure is fun. 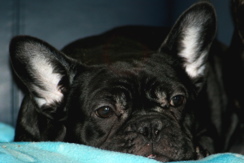 https://i0.wp.com/www.bullmarketfrogs.com/wp-content/uploads/2015/04/Brindle_pied_frenchbulldog.jpg?fit=662%2C662 662 662 Carol http://www.bullmarketfrogs.com/wp-content/uploads/2015/06/bullmarket-logo.png Carol2010-12-02 17:12:052010-12-02 17:12:05Yay for Puppies! All my dogs, all neutered/spayed, have been/currently are humpalicious. And with Lucie, who was an only dog, it’s not like she had another dog to set a bad example. She humped EVERYTHING – the cats, the furniture, our legs, the air. And it is SO mystifying why they hump dogs so big that their leetle peenies couldn’t reach the sweet spot if they were standing on a stepstool. The triump of optimism over physics? P.S Carol I sent an e-mail to you. Did it come through ok? I just got it, Marie — I am three days behind on my email, we had power outages most of yesterday (the day before I was just lazy…lol! ).